Looking back at the border from the Thailand side. 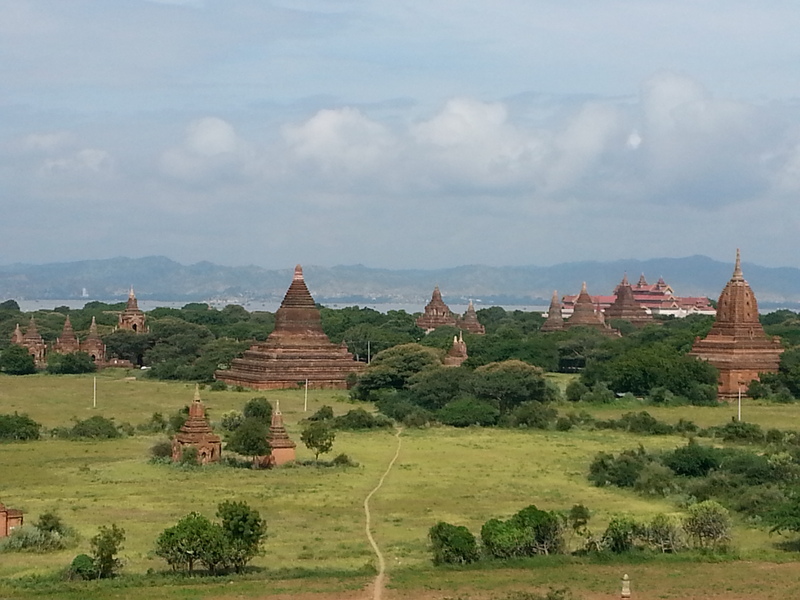 Goodby Myanmar. 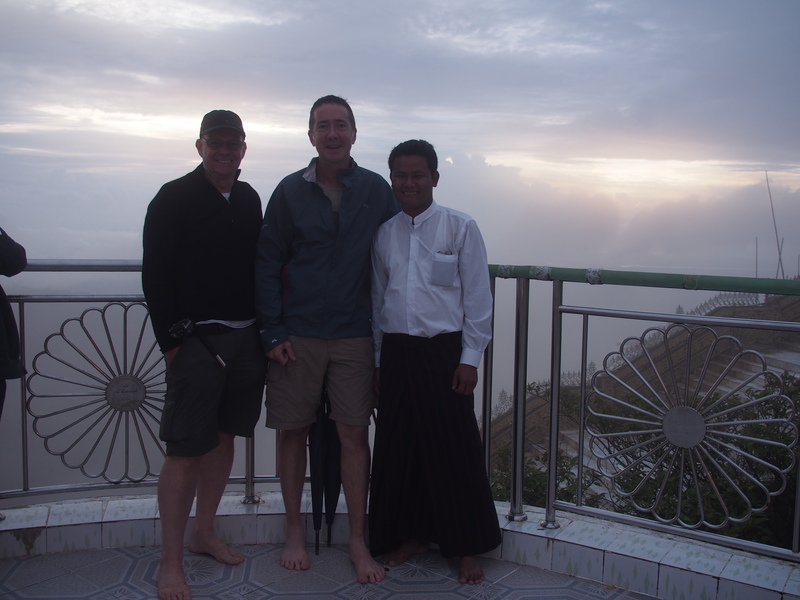 This was the day we said good by to Myanmar, a country we had enjoyed visiting. The people are wonderful, the scenery is so lush with many interesting historical sites. The ride through to the border was approximately 60km and to be honest was a very average road with large pot holes and dirt sections to start with. Fortunately the Thai government had built (as a gift) a dual carriage way for the last 25km’s or so. The road had only been open a couple of weeks and was great for bikers, with many bends and twists making for an enjoyable ride to the border. 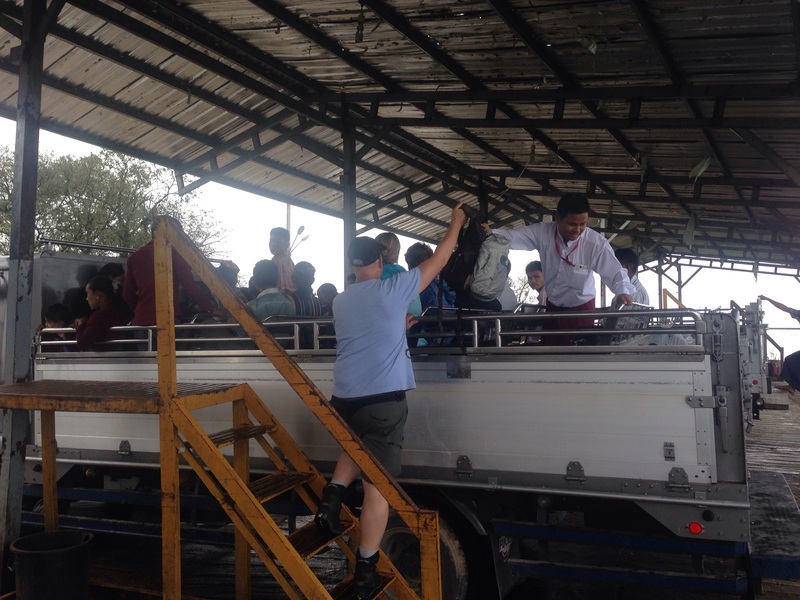 We arrived at the border, completed our paperwork and then it came time to say good by. We first arrived at the Myanmar boarder 9 days ago thinking we would have to put up with a tour company for our time in the country. Now having to say farewell to those great guys we had got to know so well, it was a very different feeling. 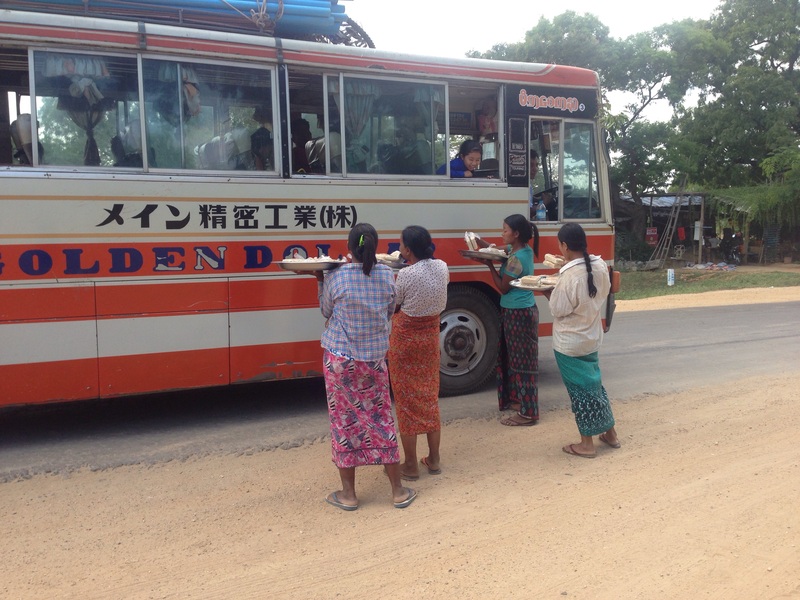 Myanmar Expert Travels & Tours did a great job and we highly recommend this company, thanks everyone. The crossing on the Thailand border entry went well and we took the time to grab at bite to eat once across. The vibe was immediately very different, with fast food outlets and a far more commercial and modern feel to it. Underway again after lunch we only had a 20km stretch to get to Mae Sot where Steve had booked a hotel. 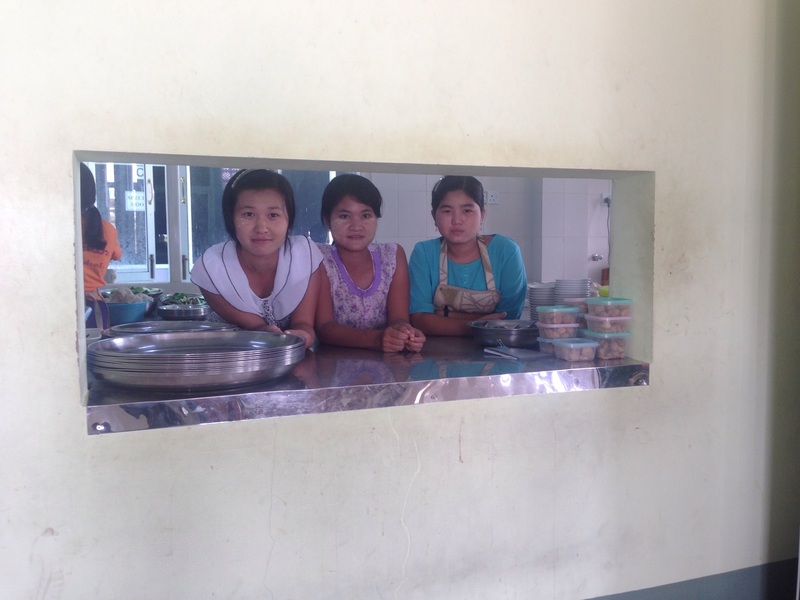 Finding the hotel once we arrived in Mae Sot was another thing. We quickly realised that the the typical sign “Hotel”was not used here and we had no hope of understanding the local writing or language. The next hour was spent trawling the side streets until we met some kind young people who knew where the hotel was and drew a map for us and we were soon sorted. So we have now made it through another country and Thailand awaits. We left the bikes at the hotel today and will collect them again tomorrow as today involved going into the town where a fleet of small trucks are used to ferry visitors up the nearby mountain to visit Kyaiktiyo Pagoda or “Golden Rock” as it was better known. Cars were banned from travelling up the mountain road up to the Rock due to the amount of crashes. So now a fleet of trucks are used to do the job with a well managed entry and exit procedure as the road is extremely tight and steep with many hair pin bends and no room for error. For those of you who enjoy a good roller coaster ride, then this ride is for you! 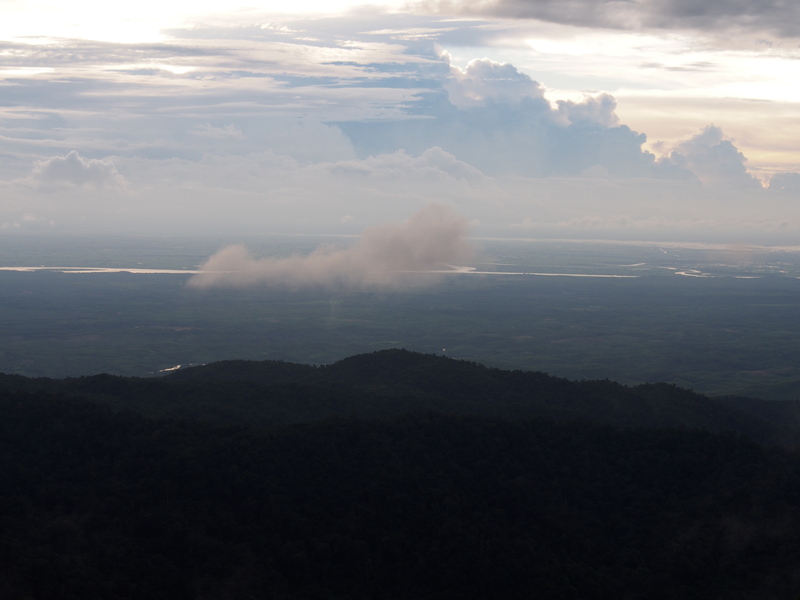 Once up the mountain we checked into a hotel as the sunset over Golden Rock was a spectacular site we were told. As the day went on it was clear that we were not going to see the sun set as it was cloudy and raining and for the first time since Spain the temps were only in the “teens”. After settling into the hotel we had a wonder around the area, which was solely geared for tourists. Fortunately the rain stayed away for most of the daylight hours left. It is said that the rock is only being held in place by a well placed strand of Buddha’s hair which stops the rock from falling. 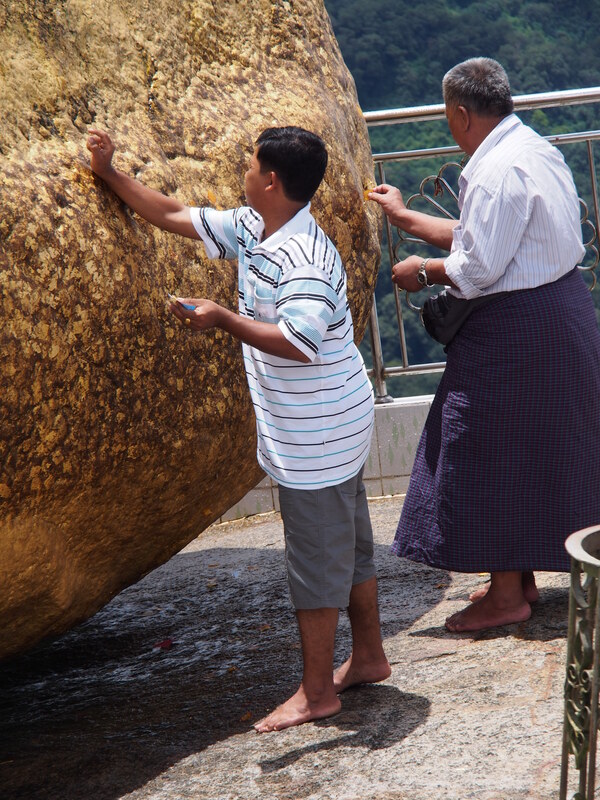 Visitors buy small stamp sized pieces of gold leaf and rub it into the rock as part of religious practices. As this area is a religious site, shoes were band from the immediate area around the rock and congregation areas nearby. 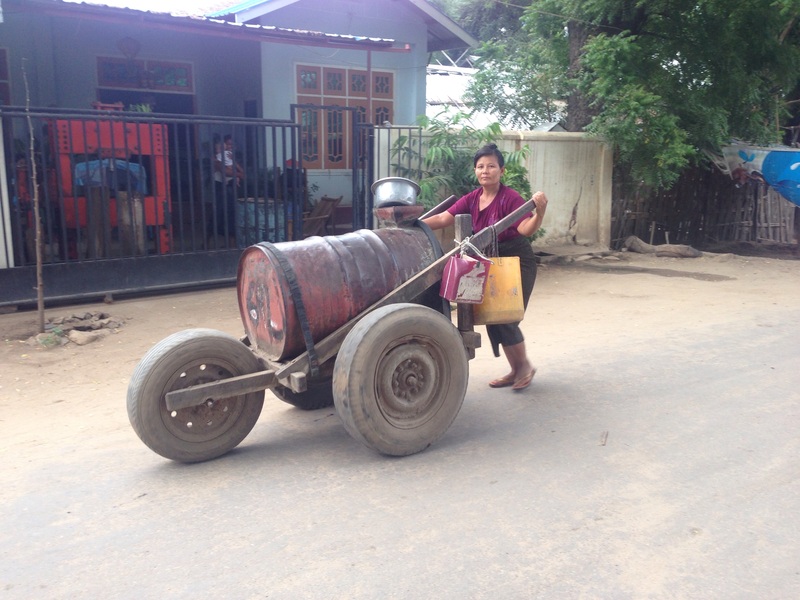 A local lady doing the daily task of collecting water. 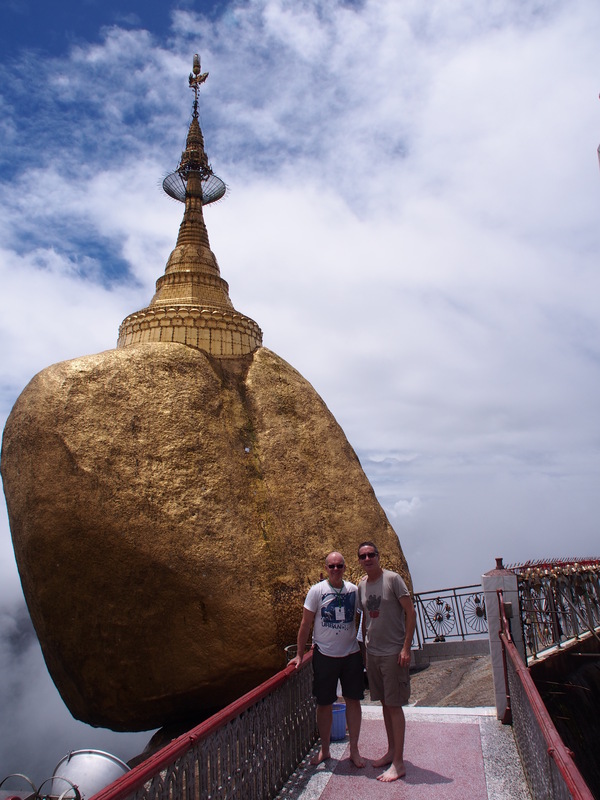 Our ride today will took us to Kin Pun Sakan which is the town located near “Golden Rock”, Myanmar’s 3rd most important religious site. The distance was 320km. The ride went straight forward, we were finding the roads much better the further south we travelled as they were less damaged by the wet season and flooding. It did start to rain as we approach our destination, fortunately only lightly. By any means necessary as this guys does not have a fuel tank so a water bottle filled with petrol will do! 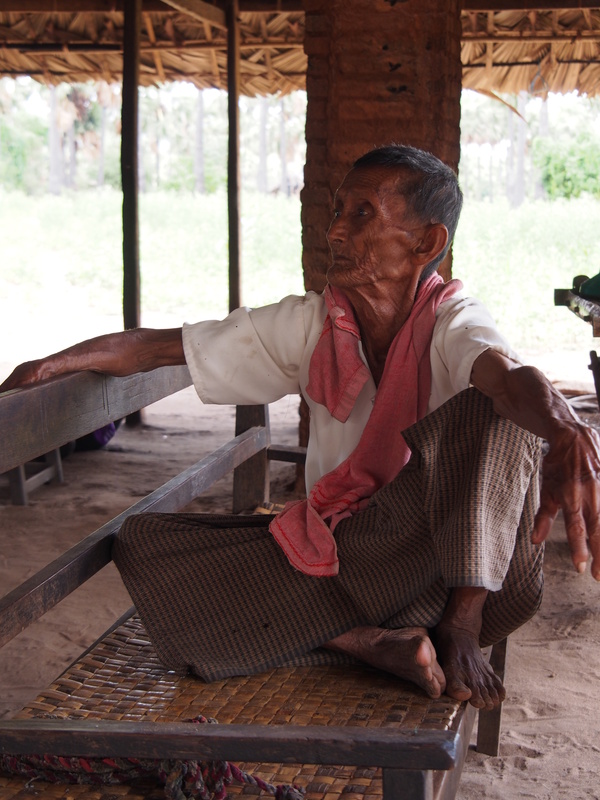 Today inloved travelling from Old Bagan to Taungoo, a distance of approx. 360km. 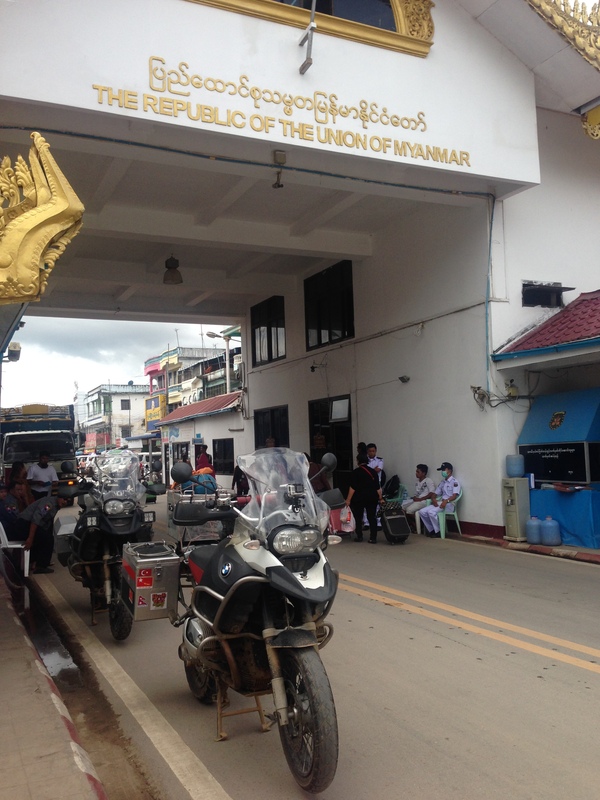 The ride took us along the Yangon – Mandalay Expressway which is a multi-laned top class toll way heading North/South. Our guides advised that we were the first motorcycles they were aware of that had been given permission to use the road, as bikes are typically banned from this high speed road as the typical 100cc motorcycle would be a danger due to their lack of speed. All aspects of our tour were subject to being granted permission by the government which involved copious amounts of paperwork prior to our arrival by the tour company that did such a great job of looking after us. The day was hot (mid 30’s) but fortunately the roads were easy going. 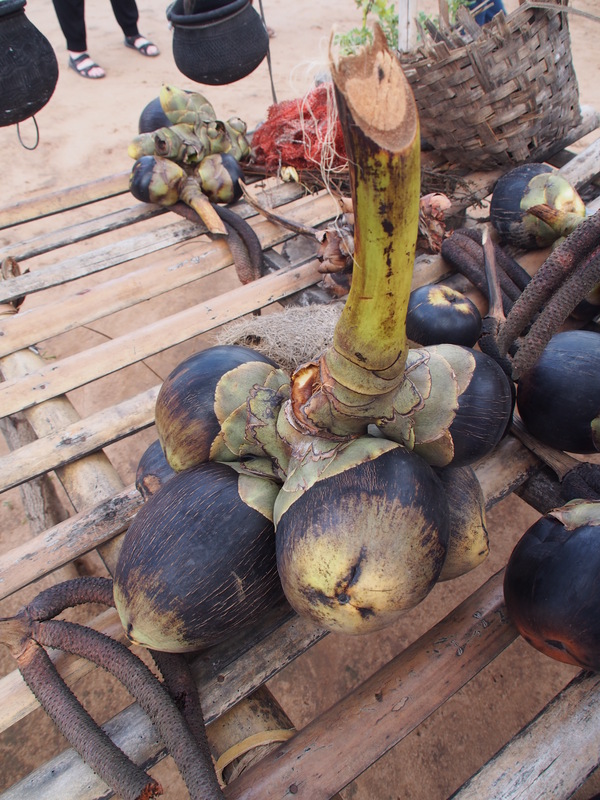 We stopped for a break at one stage and was shown some the traditional farming techniques which involved milking a local coconut sized plant for its sweet juice that is then dried and used as a sweetener. 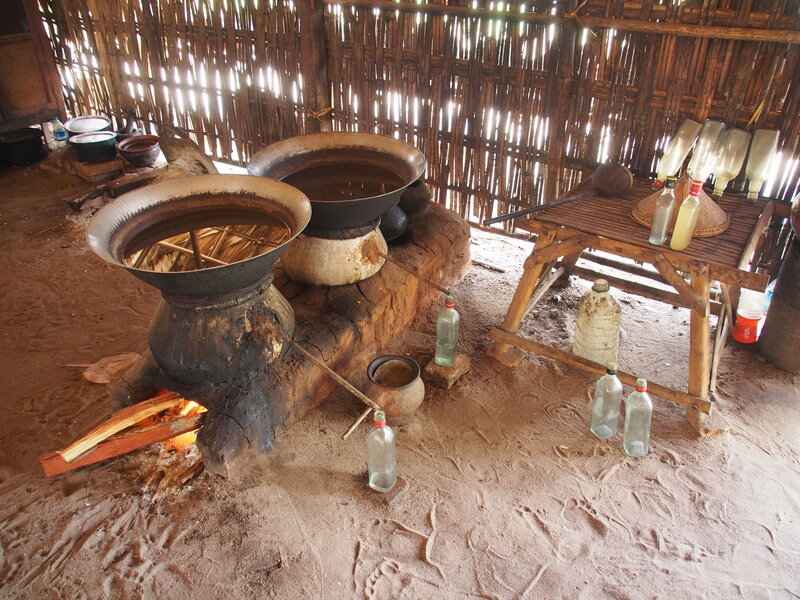 We were also shown how the local “home brew” spirit was distilled. As we made it to our hotel for the end of the day, a group of around 12 Ducati Multistrada motorbikes road by in the opposite direction on what appeared to be some sort of group organised tour. It was an exciting moment seeing other bikers riding by in such a country, unfortunately they did not stop so and we have been unable to work out any details which was a pity. Today was a day of site seeing and staying at Old Bagan so no riding, just being driven around in the Hiace van for the day which wa s pleasant change. As the weather gets very hot and humid during the day we started out at 08:00am to visit the many Buddhist temples that surrounded this historic area. We were told there are in excess of 3,000 temples in the region dating back to the 9th century, which after a short drive we were amazed at the number! 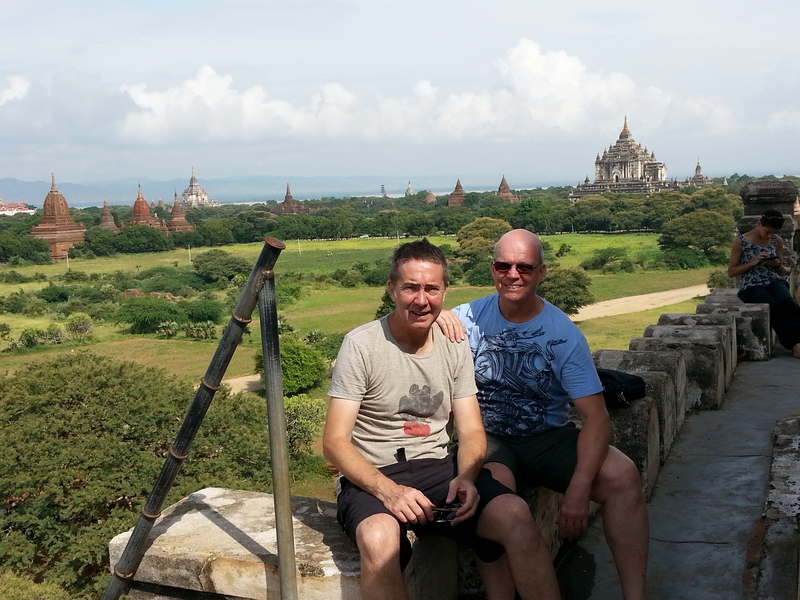 We took time to climb to the top of one of the larger temples which gave us a great view of the surrounding area. Following the site seeing we popped back to the metal workshop to collect the modified bracket that had been made for Steve’s top box. We had joked with the worker as to what colour we should paint the new part and to our amazement when we arrived there was the bracket all freshly painted and ready to fit! It didn’t take long to do the final fit up and we were soon on our way back to the hotel for the afternoon. Steve was releived the box was sorted again. The after noon was spent working on the Blog as the Internet was reasonable at the hotel and getting our selves sorted ready for tomorrow’s ride as we would be back on the road once more. 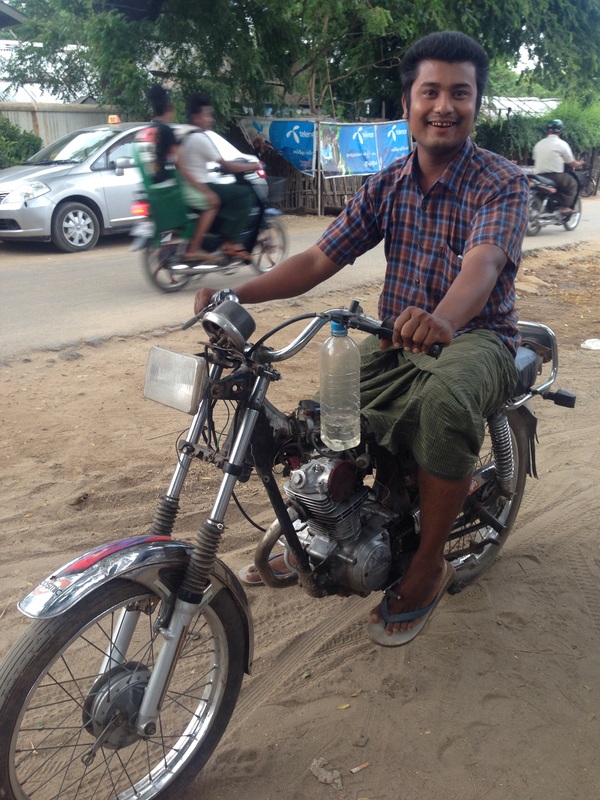 Today was an easy ride from Monywa to Old Bengan, only a distance of 244km. 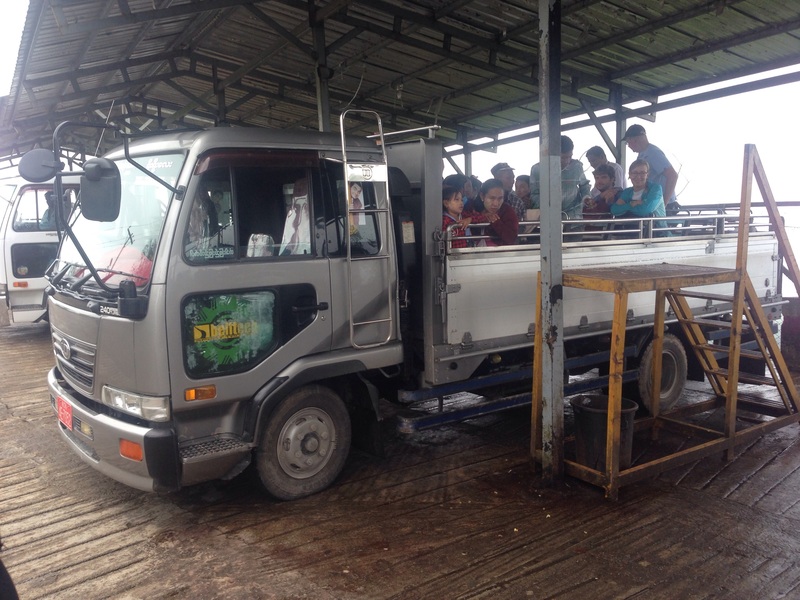 The weather was fine and we made our way with ease, riding out front of the tour guides who had hired another vehicle while the original car was being repaired. Road conditions were improving as we headed south as we were leaking the flood damaged area behind. Arriving at Old Began we had time to take Steve’s bike to a metal working workshop for additional repairs to the top box mounting as it had failed agin on the rough roads yesterday. 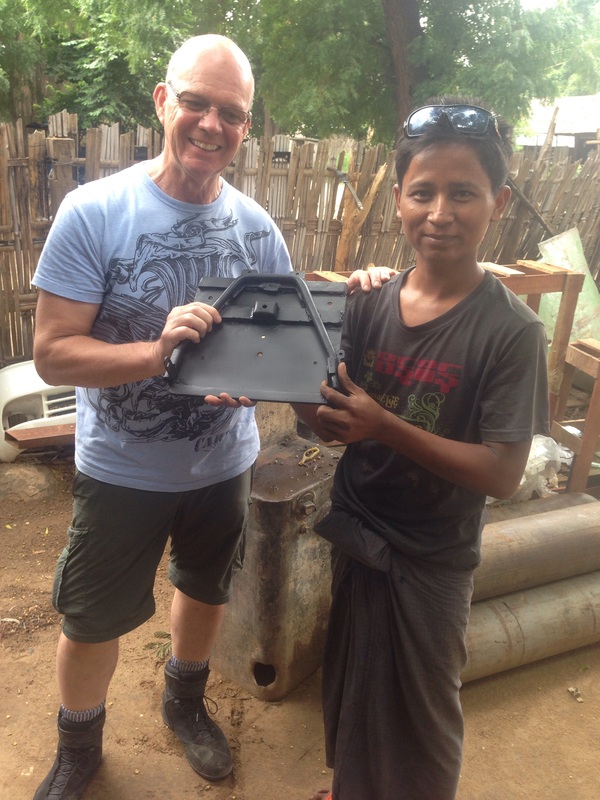 Mutu from Myanmar Expert Tours directed Steve to a great little workshop, with the young guy who knew exactly what to do in order to repair the bracket (hopefully for the last time). 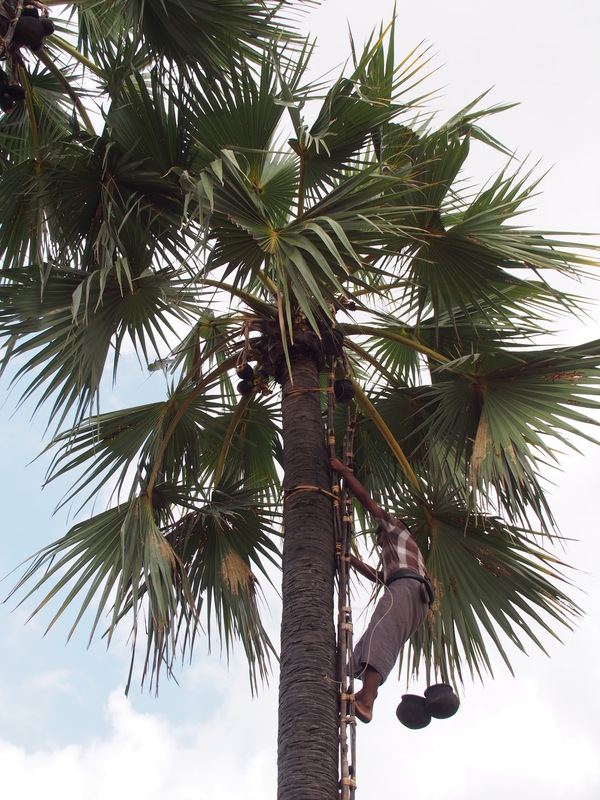 We ended up leaving due to failing light and agreed to return tomorrow to collect the finished bracket. Mutu (right) assisting with interpreting any instructions. Great job done. The evening finished with a relaxing meal and beer with our tour guides who were proving to be a great bunch, working ever so hard to attend to our needs.